﻿ CLDM - Engineered Plastics Solutions Group, Inc. 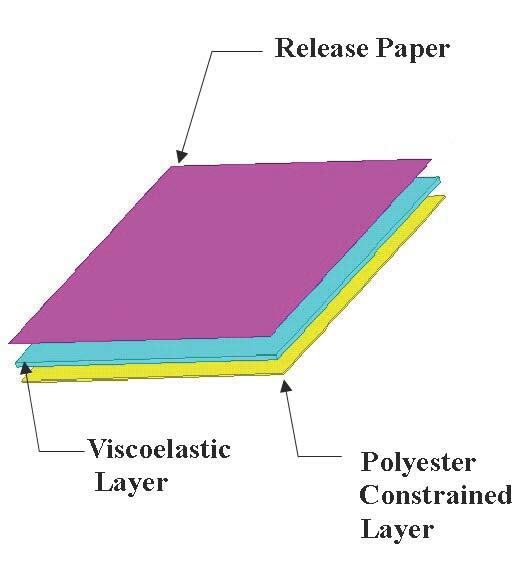 The CLDM, Constrained Layer Damping Material, has three layers: a viscoelastic damping material, a polyester constraining layer, and a protective release paper. The CLDM material is designed to offer the maximum amount of structural damping to circuit boards and panel structures by shearing the highly damped viscoelastic layer. The CLDM, Constrained Layer Damping Material, effectively and efficiently reduces the amount of vibration transmitted to a structure resulting in longer fatigue life of the structure or circuit board components. Typically, undamped structures have resonant transmissablities of 30:1 to 50:1 compared to the input. Systems using Constrained Layer Damping Material have transmissibilities of 3:1 to 10:1. This significant decrease in transmissibility directly correlates to a reduction in sound power transmission from the structure at resonance. Circuit boards can be ruggedized efficiently and cost effectively using CLDM without changes to the components.